Your involvement in this year’s event will benefit many children in the Milton area. With the proper care, your Camel could go on to win one of these distinguished awards, bringing your Organization valuable respect and acknowledgment within the Milton Community. Most Popular Camel Contest: To win the Most Popular Camel Contest, your Camel needs to be trained to solicit votes from residents of Milton. We encourage you to collect Advanced Donations ($1.00 = 1 Vote) in Displayed Ballot Boxes or On-­line Votes for the Most Popular Camel Contest. 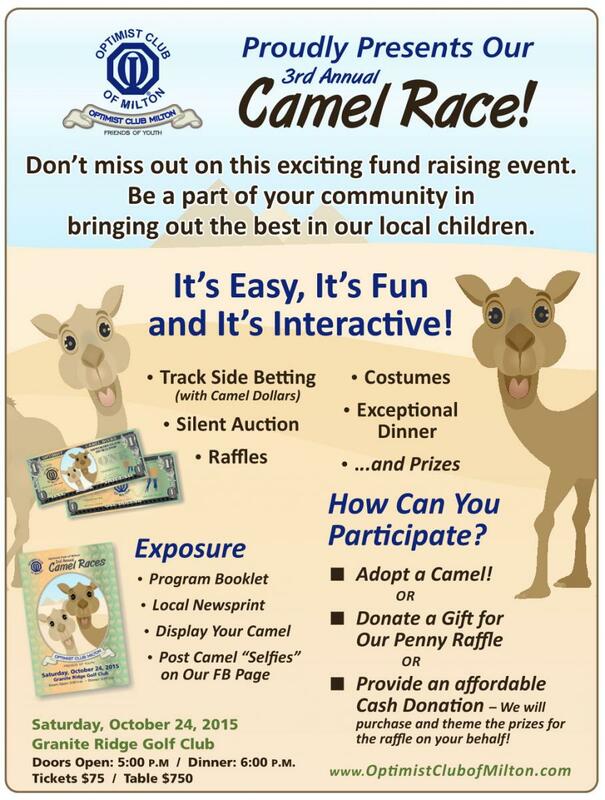 Encourage your patrons to support your Camel! We will be awarding one lucky person with a prize (TBD) for taking a selfie with at least 3 camels. Camels will be on display at local businesses after September 1st. To win, simply drive around town and locate 3 camels and take a selfie with each of them. Upload the photo here and you'll be entered. We will announce the winner at the Camel Race Dinner. To make it easier, click here to see where you can find Camels all around town. Get your tickets today for the 2015 event of the year! The Camel Race wouldn't be possible without dedicated Camel Owner's. To learn more about purchasing a Camel, the rules for being in the race, and entering it in this year's race, click here!